If you are active Google Voice users and would like to try this on your iPhone, here is a piece of good news that Apple has finally approved the app which integrates the great Google Voice feature in your iPhone. Previously, user has to depends on web-based Google Voice Mobile or third-party apps such as GV Mobile + to use Google Voice feature on iPhone. Instant push alert notifications for both new voicemail and SMS text messages. Free text messages to any local and domestic US numbers. 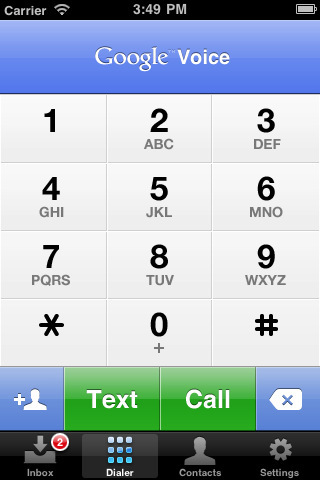 Display Google Voice number as Caller ID when making calls. Calls will be placed via Direct Access Numbers, making them connect just as quickly as regular phone calls. In order to utilize these features, users will need to sign up for an account at www.google.com/voice. However, Google Voice is currently only available in United States so for those that are residing in other geographic areas, they will have to wait further (until 2011 with world wide availability) or rely on third party Google Voice apps first. As compared to those, the new official Google Voice is claimed to be much faster and even much more convenient than previous HTML5 web app version without direct phone book access limitation. It’s important to note that Google Voice for iPhone is not a VoIP app. Users may be charged for minutes for the all calls (on regular local call rate) as the app calls direct local number to route the call to the recipient’s number. Thus, the only advantages of Google Voice in term of reducing calling cost is calling to Canada, which is free if free minutes of the mobile voice plan still available (of pay only local call charge), and free SMS messaging or text messaging. Google Voice is currently available for free download in App Store. However, it is only compatible with iPhone on iOS 3.0 or later and should be able to work with iPod and iPad in short future.